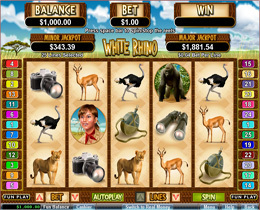 White Rhino - a 5 Reel, 25 Payline Slot with an African Safari theme with a variety of special features. This game is for those that love adventure and the thrill of wild animals! The graphics are quite realistic and colorful including characters such as tourists, guides, camera, binoculars, Jeep, deer, elephants, gorillas, ostriches, the white rhino and Kilimanjaro. There are many winning opportunities and a great range of bet amounts on offer. 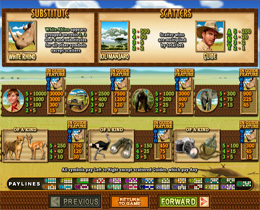 The bet amount will not determine the chances of hitting a jackpot since both are random and can be won after each spin. The Wild appears stacked on reels 2, 3, and 4 and helps by replacing other regular symbols. Re-triggering free spins will be activated. 3 Free games will be awarded for activating the feature, plus an additional 3 spins per Rhino. Kilimanjaro will trigger a re-spin feature when 2 or more appear from left to right, re-spinning the reels 3 times, but holding all reels where the Kilimanjaro symbol appears. The Guide – when 3 or more appear anywhere they will activate a round of 10 Free Spins. All prizes will triple where the White Rhino substitutes for one or more of the symbols. Here's your chance to go out on safari, in search for that elusive Rhino and win a Jackpot! There is a huge 5 of a kind prize of 30 000 times your line bet, even in multiple random jackpots, which allows you a chance to win big. There are 2 Progressive Jackpots, a minor and major jackpot which get randomly activated. The Auto Play feature runs from 5 to 1 000 spins. The turbo mode can also be enabled for players who want to play at fast speed. The background is of the African plains, mostly resembling the vast open plains of the Serengeti. The White Rhino comes to life as it tosses its head while the guide drives the jeep through the plains. Take some time to admire the wildlife and the snow capped Kilimanjaro! A must-play game for nature lovers.